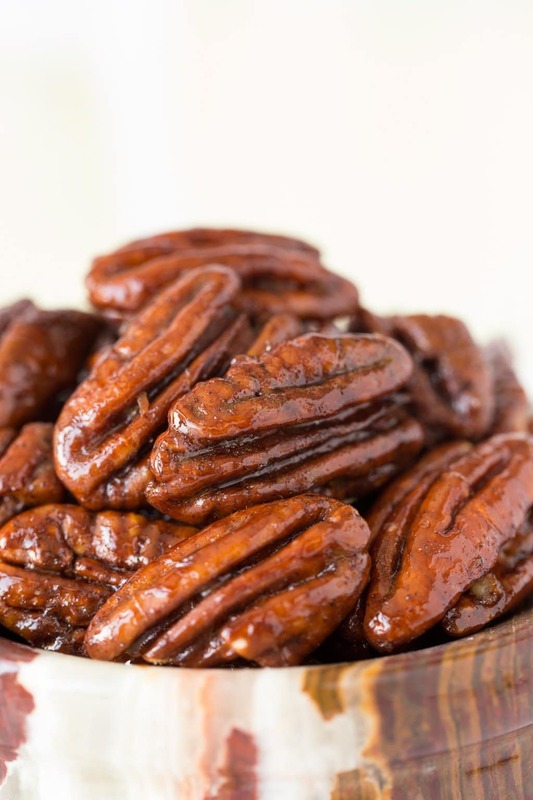 These pecans are super delicious and fabulous as a snack or cocktail nibble, on salads, or desserts … and they make a wonderful gift too! Even though the temps here in North Carolina have been soaring into the mid-90’s, I feel like I’ve stepped over the edge. Into fall. How about you? I love that nights are getting cooler, making morning walks and bike rides a delight, rather than a steamy chore. And while everything’s still quite green, hints of yellow and red can be observed here and there. Each tiny splash of color reminds me there’s a new season on the way. Despite the fact that one of our local stores has had ceramic jack-o’-lanterns on display for over a month, I’m not quite ready for pumpkin. But maple and molasses sound wonderful, and are a perfect way to “step over the edge”. 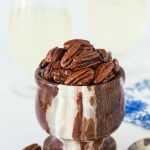 I think you’ll love these Maple Molasses Glazed Pecans, and will find lots of ways to use them this fall. Besides being an addictively delicious snack, they’re also wonderful as a cocktail nibble, in salads and add a touch of crunchy gourmet, elegance to all kinds of desserts. How about a great dessert idea? 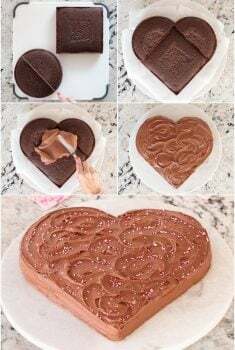 Want an easy dessert idea that will wow everyone? Pick up some good vanilla ice cream, then whip up a batch of Microwave Caramel Sauce (the real deal). 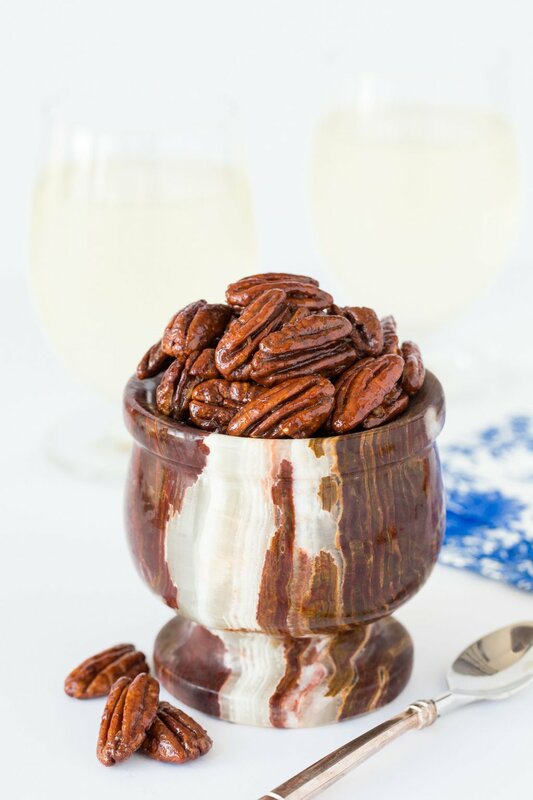 Sprinkle your delicious sundaes with a few Maple Molasses Glazed Pecans – I promise, everyone will be in heaven! 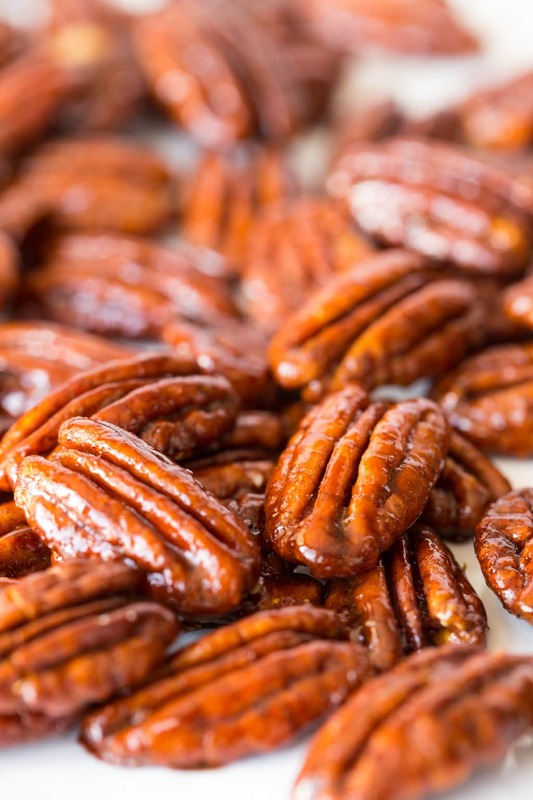 It took a few batches to get these pecans right. 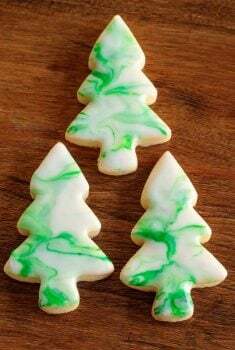 I was looking for a shiny, beautiful glaze and the first couple tries just didn’t make it. With a bit of testing and tweaking, I figured out a few little tricks to achieve the sheen I was looking for. I learned that the nuts need to be completely coated with the glaze before they go into the oven. Several little steps help me accomplish that. First, a short stint in the microwave (which thins out the syrup and molasses). A very thorough stir (one minute) after microwaving is also important. Lastly, having enough of the glaze makes a difference. After experimenting, I learned that 1/4 cup of maple syrup is the perfect amount. The hands-on time (less than 5 minutes) and effort is pretty minimal with these delicious pecans, but no one needs to know that. Maple, molasses and a touch of cinnamon wrap around the nuts to give a warm, wonderful flavor you can’t quite put your finger on. Need a little hostess, teacher or new-neighbor gift? Whip up a batch of these Maple Molasses Glazed Pecans, pack them up in a cellophane bag and add a pretty ribbon. They’ll want to know which little gourmet market you picked them up at. So come on, step over the edge with me. You’ll be deliciously happy you did! P.S. I love these pre-cut sheets of parchment paper. They save time, are super convenient and a package like this lasts forever (even for a crazy cook like me!). 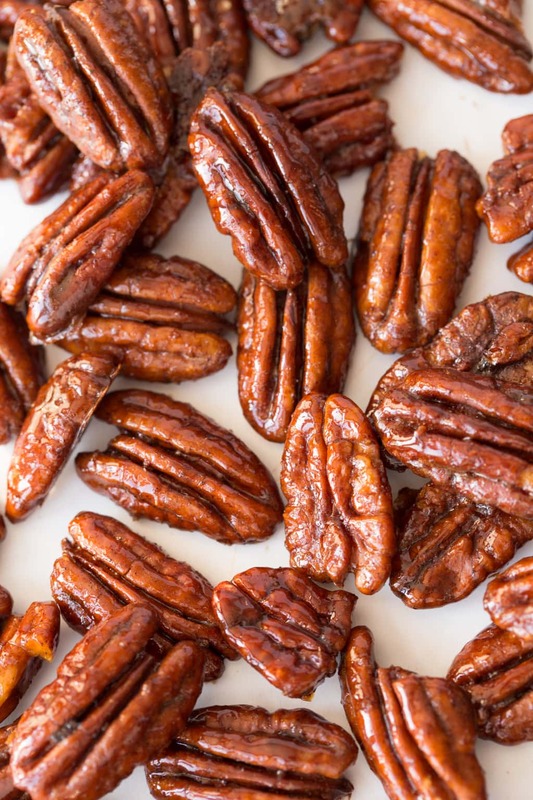 Super easy and crazy delicious, these maple molasses glazed pecans are fabulous as a snack or cocktail nibble, on salads or desserts. Plus they make a wonderful gift! Preheat oven to 325˚F. Line a sheet pan with parchment paper (this will keep nuts from sticking to pan). Lay out a second piece of parchment paper on a work surface. Combine all ingredients except pecans in a medium microwave-safe bowl. Stir well. Add pecans, then place bowl in microwave and cook on high power for 1 minute. This will thin out the maple mixture to help it coat the pecans better. Stir continuously for 1 minute (no cheating, you want the syrup mixture to get in every little nook and cranny of the pecans), until pecans are thoroughly coated. Turn pecans out onto prepared sheet pan, making sure to scrape out all of the maple syrup mixture as well. Spread out pecans to a single layer on the pan. Place pan in oven and bake for 10 minutes. Remove from oven and stir well to redistribute nuts then spread out again to a single layer. Bake until deep golden brown, about 8-12 minutes more. Watch them carefully towards the end as nuts can quickly burn. Stir again after removing from oven then spread out on a fresh sheet of parchment paper. Allow to cool completely, then transfer to an airtight container for storage. I just made these and they are fantastic! Hi Chris, I sought out this recipe as a way to include more nuts in my diet for their nutritional value. As far as sweeteners go I know that maple, molasses and cinnamon are all on the healthy side if used in moderation. However, I was wondering if baking the nuts in the oven affected their national value at all? I know that cooking many foods can reduce or eliminate the nutritional benefits that would be gained from eating them raw. Would baking affect the health benefits of pecans or other nuts like almonds and walnuts? Hi Ursula, I remember Stuckey’s but don’t think I ever had that candy. The glaze is fairly hard on these pecans so I’m not sure that would work for this candy. most things. Can I freeze them in plastic bags or put them in a sealed jar on a shelf?. Can I keep them for months? Even if I can’t I’ll make them for all to enjoy. I haven’t tried to freeze these pecans but I think it should be fine. I would freeze them on a sheet pan, then when frozen slip them into a ziplock bag. 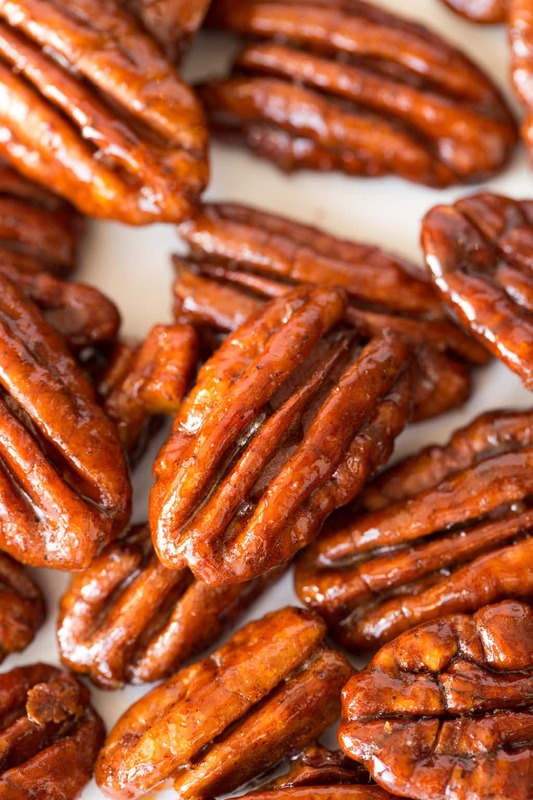 These pecans look irresistible! 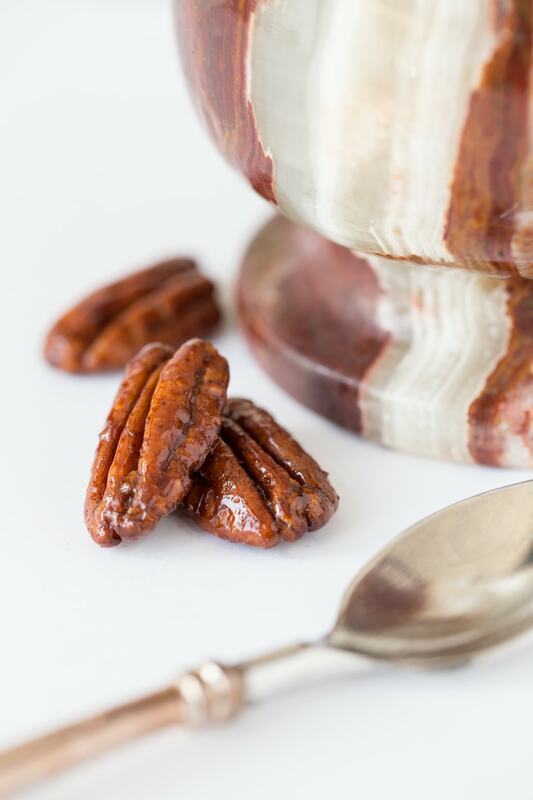 That glaze sounds incredible, I know I’d be snacking on these pecans all day long! With my tree nut allergy, I almost skipped this post, but I am glad I didn’t! The glaze sounds like it would be great on peanuts (which I CAN eat) too! Maple and molasses are wonderful flavors for dipping your toes at the edge of fall. Cinnamon too! I love, love candied pecans—and these flavors are perfect for autumn! 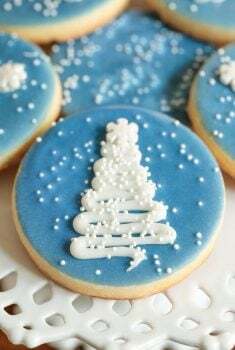 I’d love a stash for holiday hostess gifts, too!! I try to keep brown sugar-butter pecans on hand for salads especially, Chris, and will have to try your version, the maple syrup sounds divine! You found the perfect container for these! This is a beautiful and delicious gateway snack to fall season. Hi Renuka, I think walnuts should work fine, although I haven’t tried them. I would make sure to stir them really, really, well to make sure they get coated with the syrup mixture as walnuts have even more nooks and crannies than pecans! Let us know how they turn out. Love these Chris, these are the real deal. I have bought them pre-made before and they were like rocks. Pinned! Is it 2 cups of pecans for this recipe? Yes, it is! Thanks so much for noticing that. I’ve corrected the recipe. They look incredibly delicious and addictive too! Thanks Angie, it’s extremely difficult to eat just a few of them! I have made with MS never w/ molasses must try:) They look lovely..standalone or in salads. Sounds yummy and appears doable without the microwave! 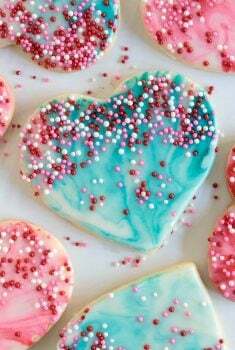 Thanks Jo Anne, yes you could definitely use the stovetop to make these. Enjoy!